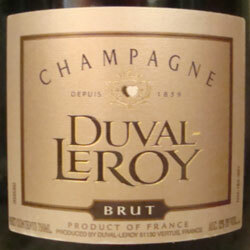 Champagne Duval-Leroy is a 100% family owned situated in Vertus in La Cote des Blancs. It was founded in1859 by the Duval and the Leroy families and they have 200 Hectares of grapes which takes care of 1/3 of their needs. Duval-Leroy is run by Carol Duval-Leroy, who suddenly found herself in charge when her 49 year old husband Jean-Charles suddenly and unexpectedly died in 1991. She is generally credited with raising the quality of the wines and the stature of the house. They currently are the 9th largest Champagne producer and one of the largest landowners in the region, producing a wide range of Champagne, many of them delightfully Chardonnay heavy, and some of the most popular are described below. This is a widely available and pleasant Champagne and a good deal. It is reportedly mostly Pinot Noir despite Duval-Leroy being a heavily Chardonnay house. A good entry level effort. These include a Non Vintage Blanc de blancs, as well as a vintage Blanc de blanc, the Clos des Bouveries, from a single vineyard and partially fermented in oak casts and partially fermented in from a mid slope vineyard facing due east over the village of Vertus. This makes an excellent starting wine, and I last had a lovely half bottle in MKs in Chicago before dinner. It as a very light color, rather dry, and has tastes of strawberries and lighty toasted bread. It is made by the 'saignee' method, i.e. the color comes from the pressed grape juice being left in contact with the skins, not from the addition of some still Pinot Noir like most Roses. This is a very pretty tasting and looking wine and reasonably priced too! This is their Prestige Cuvee, a vintage wine, mostly Chardonnay with a touch of Pinot Noir added. The Chardonnay, all grand cru, is from Mont-Aigu from Chouilly, Terre de Noël from Oger, Chapelle of Avize, and Chetillon and Aillerand from Mesnil sur Oger, and aged separately in oak barrels. Recently made in 1990, 1995, 1996, and 2000, the 1996 is an absolutely stunner that will last a long time much like many 96s, and I look forward to hopefully trying the 2000 someday. They also make quite a few other wines, including a Vintage Blanc de noirs, the Authentis Cumières 2003 and a demi-sec which reportedly goes extremely well with pastries. I'll look forward to trying these someday although they are not easily findable, at least in the US. You can find their multilingual French and English language Web site here. The nose has fresh sourdough bread rolls, a pleasant touch of hard cheese (Parmesan? ), lemon and chalk. A very "fresh" nose! On the palate there is Meyer lemon, orange, apple. There are definitely some minerals, but this is more about fruit. At about US$30, and I paid less on sale, this is a great deal! Always a crowd pleaser.